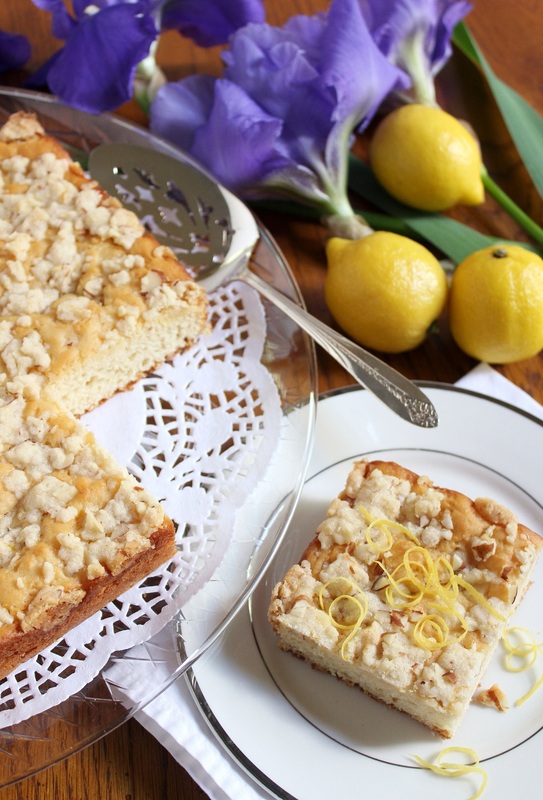 A tender yeast cake with a super topping - crunchy and lemony! In large mixer bowl, combine 1¼ cups flour, yeast, sugar and salt; mix well. In saucepan or microwave-safe bowl, heat buttermilk, water and shortening/oil until warm (120-130°F; shortening/oil doesn't need to melt). Add to flour mixture. Add egg. Blend at low speed until moistened; beat 3 minutes at medium speed. By hand, gradually stir in enough remaining flour to make a soft dough. Knead on floured surface until smooth and elastic, about 3 minutes. Cover; let rest 5 minutes. Prepare topping: Combine all topping ingredients; set aside. Press dough in a greased 9-inch square cake pan. Sprinkle topping over dough. With back of spoon, make random indentations in dough. Cover; let rise in warm place until double, about 30 minutes. While dough is rising, preheat oven to 375°F. Bake for 25 to 30 minutes until golden brown. Serve warm or room temperature. Optional: garnish with additional lemon zest.